Members of the Altona Laverton Historical Society in conjunction with members of the Louis Joel Arts and Community Centre have completed the project of recording the history and stories of this wonderful institution. 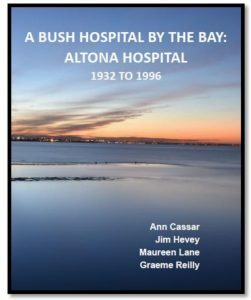 The book “A Bush Hospital By The Bay” is available for purchase at the Altona Homestead, during opening hours, or from the Louis Joel Arts & Community Centre for the price of $25. The publication looks at the Doctors, Nurses, Staff Board Members, Ladies Auxiliary members, Local Community group, Local Councilors and State Government areas that all contributed to make the Hospital not just a building providing health care but what can be truly call the ‘Heartbeat of the Community’. A place built, supported and cared for by the people of the community of Altona for the people. This great Book is on sale at the Altona Homestead or at the Louis Joel Centre (5 Sargood St Altona) for the price of $25. Whilst the book has been published we are still collecting and recording the thousands of names of people who were born at the Altona Hospital. We see this a a vital piece of history that should not only be recorded for future generations but we display these names within a presentation (a Honour Roll) that shows at the Homestead during opening hours. If you wish to add your name or the names of you relatives please email the following details to g.reilly@alhs.com.au. Details: First Name, Second Name, Current Surname, Surname at Birth (if different), and Year of Birth.